"Bumblebee," the first live-action Transformers movie to be directed by somebody other than Michael Bay, a Bizarro World version of this year's "The Predator," though only in one very particular way: there's too much undercooked human drama and not enough 'splodey high-concept stuff (which is competent). Sure, "Bumblebee" may seem like a welcome change-up after six Bay-ified Transformers flicks. But, as somebody who quit the recently revived franchise after the fourth entry, I have to say: so what? "Bumblebee" is only comparatively modest: it's 113 minutes and feels longer, and plays like a lukewarm, John Hughes-ified clone of "E.T. : The Extra-Terrestrial." There's not only nothing new here, there's nothing convincing. And if I'm supposed to judge "Bumblebee" based on how well it succeeds at what it tries to do (rather than what came before it), it's still not very good. "Bumblebee" begins with a lifeless homage/tip of the cap to the animated "Transformers: The Movie." War has come to Cybertron, the home of the Autobots—who have apparently already visited Earth, and therefore look like cars—and the Decepticons, who also look like cars and jets and things, despite ... not having been to Earth yet? You guessed it, dear reader: "Bumblebee" is a prequel, a bridge between the notoriously confusing "Transformers: The Movie" and Bay's tediously noisy "Transformers," so it makes sense that this new movie should be ... well, a bit like both the older Transformers film and the newer Transformer films, actually. 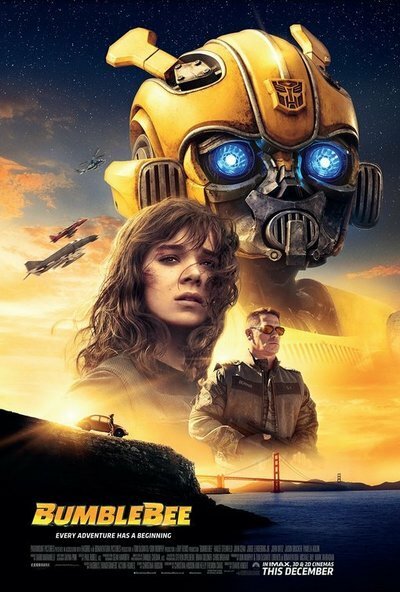 Yet while "Bumblebee" is a movie where sentient war machine robots go pew-pew at each other—and blow up trucks, and sometimes reduce human beings to translucent goo—this is also apparently a film about generically rebellious teenager Charlie Watson ("True Grit" star Hailee Steinfeld), a young woman who listens to The Smiths, resents her mom ("Better Things" star Pamela Adlon), and has a tentative romance with a wimpy boy-next-neighbor named Memo (Jorge Lendeborg Jr.). Throw in the mute, nigh-magical, E.T.-like Bumblebee, and bam, you got yourself a thrice-nuked fish-out-of-water-tale. The film's "formulaic" nature isn't necessarily a bad thing. Problems do, however, inevitably arise with "Bumblebee" since it often appears to be stuck on fast-forward, especially during big emotional moments. Several key scenes—ones that are supposed to establish the film's heartstring-tugging stakes—feel bewilderingly inconsequential, but only because screenwriter Christina Hodson's scenario (realized as it is by director Travis Knight and the gang), feels totally rushed. It's enough to leave viewers with burning questions, though the answers to those questions might seem obvious to anyone who's cursorily familiar with post-"E.T." fish out of water stories. Like: why did Bumblebee wait so long—in an early scene, before he loses his voice, and also one second before missiles decimate a bunch of gruff military guys—to command them to "Run?" Because the filmmakers don't have an extra couple seconds to earn genuine dramatic tension, not when they could just make their robot hero strike a cool pose and then get blown up. And why did Hodson and company have the film's villainous Decepticons kill Bumblebee’s Autobot friend on another planet before viewers are introduced to that character in a prior scene? Because wanton death is dramatic! As for the film's supporting characters, the one whose expectations Charlie rebels against: they're sadly not well-developed either. Which is a problem, since I can't root very hard for Charlie if my expectations are not overturned with hers. Stephen Schneider's amiably goony stepdad isn’t a convincing stick in the mud since his character's most heinous crimes against Charlie are practicing defensive driving and earnestly recommending one self-help book. And John Cena—playing cranky-pants, anti-robot military guy Agent Burns—isn’t a believable trigger-happy villain, despite the scary scar on his cheek. Finally, Lendeborg's Memo isn’t a credible nerd, despite the way he breathlessly explains why he wears disposable hair nets (sanitary reasons) when he’s confronted by a vaguely threatening valley girl bully. Then again, what would you expect from a movie that asks viewers to fall in love with Bumblebee, a character who (in this film) appears to be a cuddly VW-shaped war machine? At the beginning of the movie, Bumblebee blows up a robot to rescue of his leader Optimus Prime (Peter Cullen). Later, after a bunch of sappy moments that don't quite land, he blows up a bunch of other stuff (mostly inanimate). Yes, Bumblebee ostensibly loves Charlie, his human owner/buddy. But the military? And the bad robots? According to the film’s aimlessly destructive (but convincing) logic, Bumblebee delivers the only fitting punishment for their (inefficient) kind of violent intolerance: total destruction. Look, I’m not expecting the shooty-shoot robot movie to deliver a great anti-war, anti-consumerist epic (I used to love “Transformers: Beast Wars” when I was a pre-teen). I do, however, wish that somebody who was responsible for this film’s creation was a little more serious about the tropes that they mercilessly ripped off, I mean borrowed, from executive producer Steven Spielberg. There's nothing implicitly wrong with this movie's approach. You just have to do something with it.